President Donald Trump’s proposed cutbacks to the Environmental Protection Agency may include the closure of the agency’s regional office in Chicago, a move that could undermine the agency’s ability to monitor pollution in the Great Lakes and curtail its ability to implement enforcement actions against coal-fired power plant owners in the six-state region. The workforce for the Chicago Region 5 office would be consolidated with the EPA office in Kansas, the Chicago Sun-Times reported, citing anonymous sources. Trump’s budget chief Mick Mulvaney singled out the EPA as a target for budget cuts and the agency, under the leadership of former Oklahoma attorney general Scott Pruitt, was tasked with choosing two regional office for closure by June 15. The identity of the other regional office has yet to be disclosed. “This decision doesn’t make sense from an efficiency standpoint. Instead, this decision makes sense from an ideological standpoint,” Nicole Cantello, the head of the union representing agency employees in the region, told ThinkProgress. She received leaked information about the possible closure of the regional office and believes it accurately represents the intentions of the Trump administration. News about the Trump administration’s plans to close the Chicago EPA office leaked the same week the agency discovered a potentially carcinogenic chemical had spilled from a U.S. Steel facility in Indiana into a tributary of Lake Michigan. U.S. Steel reported last Tuesday that it leaked an unknown amount of wastewater containing hexavalent chromium into a waterway in Portage, Indiana, within 100 yards of the lake. The Region 5 office oversees environmental protection in six states surrounding the Great Lakes: Illinois, Indiana, Michigan, Minnesota, Ohio and Wisconsin. “It would be devastating to environmental protection in Region 5, the office that is the steward of the Great Lakes,” Cantello insisted. Consolidating the two regions would make EPA Region 7, located in Kansas City, Kansas, the largest regional office in the nation, covering 10 states. Region 5 has expertise in dealing with the states in the upper Midwest and a deep knowledge of Great Lakes protection. “That expertise would be completely lost,” Cantello said. Under the administration’s plan, 3,000 EPA employees nationwide would lose their jobs. Closing the Chicago office, and eliminating its 1,000 positions, would help accomplish that goal. Whether any employees would be transferred to the Kansas office is unknown. But the EPA regional office in Kansas does not have adequate space to accommodate hundreds of new employees, Cantello said. Rep. Dan Kildee (D-MI), whose congressional district includes the city of Flint, called reports of the proposed closure of EPA’s Chicago a “misguided” move that would jeopardize federal resources to help Flint recover from its water crisis. EPA employees rallied in early February against the impending confirmation Pruitt as EPA Administrator, in what was the first protest by federal workers against the Trump administration. 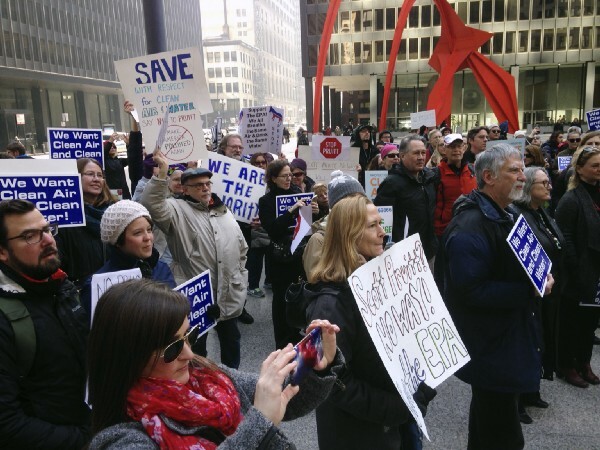 Roughly 300 people—a third of whom work for the agency—took to the street outside the agency’s Chicago regional office. With the latest leaked information about the possible closure of the Region 5 office, Cantello said her union plans to work with members of Congress from the six states to fight back against the closure of the Chicago office. The Trump administration plans to focus on regional offices for job cuts, not the EPA’s headquarters in Washington, D.C. Along with Chicago, employees housed in other regional offices are fighting back against the administration’s plans to gut the agency. In the EPA Region 3 office, the mood “is fear, dread,” Marie Owens Powell, an EPA enforcement officer and a local union leader, told National Public Radio’s Morning Edition. The Philadelphia office employees hope they can persuade their representatives to save the EPA and convince friends and family to speak out in defense of the agency’s work, the union leader said. A recent poll by Quinnipiac University showed a large majority of U.S. voters oppose cutting EPA’s budget. This article was originally posted at Thinkprogress.org on April 17, 2017. Reprinted with permission. Mark Hand is a climate reporter for Think Progress. Contact him at mhand@americanprogress.org. You are currently browsing the archives for the EPA category.